It takes all sorts to make the world in Minecraft Creeper Dancing. None can tell how many secrets or amazing facts about the living creatures around us. This time, we’d like to invite you to a dancing show performing by a cute creeper. The aim of this game is to watch this dancing creeper as long as you can. If you roll the mouse out of the dancing area, you lose. The height of the score depends on how long you have already watched its dancing. Watch it dancing and evaluate whether its dance is attractive or not! 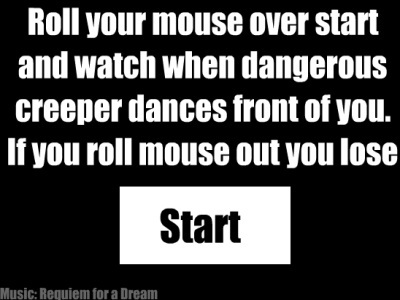 Just watch it dancing and not to drag the mouse out of the dancing field.